Why wait for a “big number” birthday to visit one of your wish list restaurants? 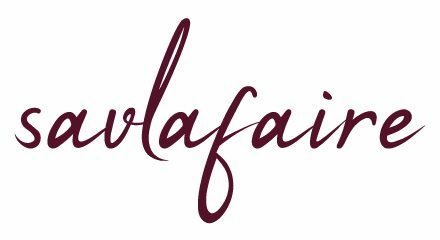 With that in mind, I eagerly booked a table at the 3-Michelin-starred Alain Ducasse at The Dorchester for Chef Savla’s 35th two months in advance. Keeping schtum was a challenge, but it was worth it to see his surprised face! We arrived early, so had plenty of time to enjoy the elegant Christmas tree, the oversized gingerbread house and the famous Promenade where they serve afternoon tea. En route to our table, I took in the tasteful decor, muted colours and miniature vegetable sculptures. Since we were struggling to narrow down our choices, the 7-course tasting menu seemed like the best solution (especially after champagne!). Light and cheesy gougères were followed by an excellent bread basket and then came the first dish: Dorset crab with avocado and caviar. 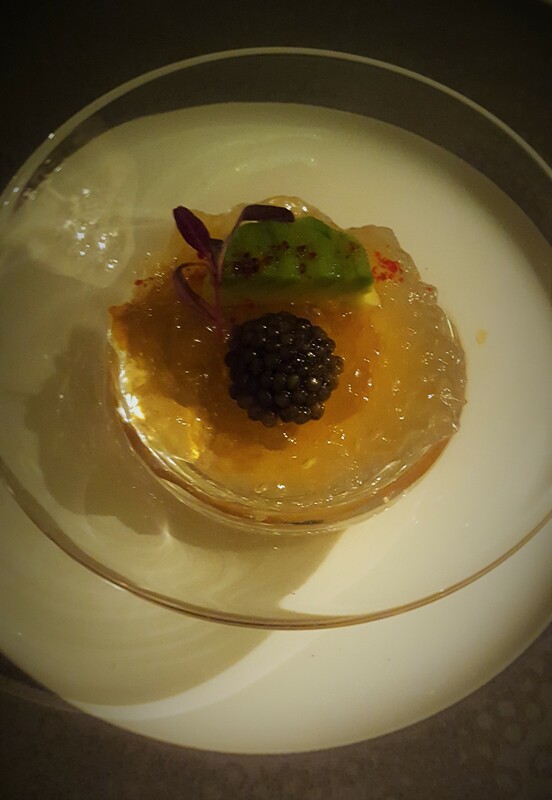 Although crab is one of my least favourite things, its delicate flavour combined with the cool jelly won me over. Unfortunately, Chef Savla found a piece of shell in his, so he was less enthused. An alternative dish was offered, but as we still had 6 courses on the way, we preferred to leave some space for now. 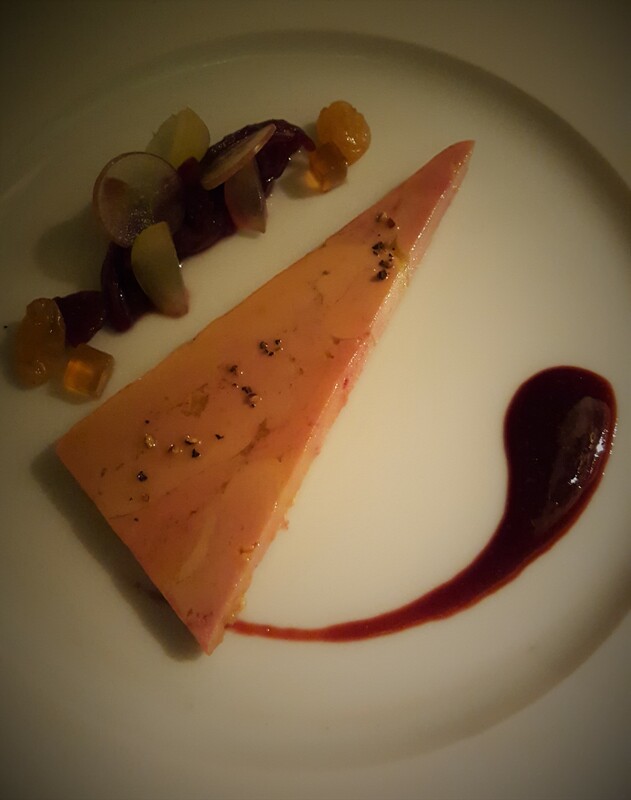 The preserved foie gras with white and black grapes more than compensated for the earlier mishap. Served with warm toast, it was as rich, silky and decadent as it should be. 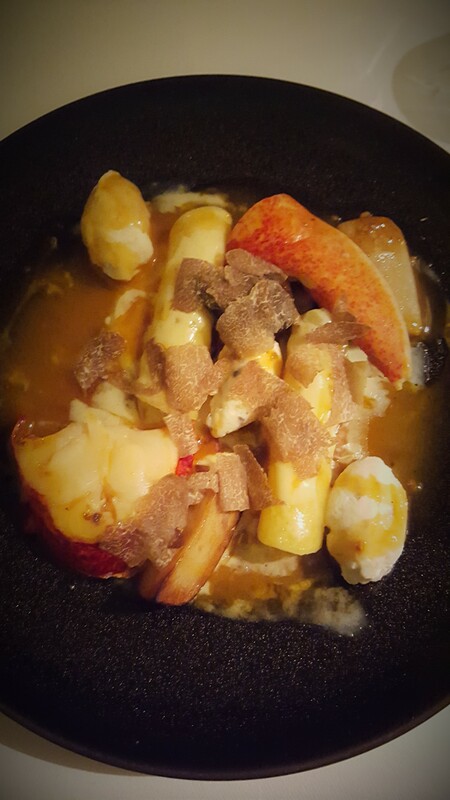 The third course was a lobster sauté with truffled chicken quenelles. The individual elements were perfectly cooked and complemented by the lobster bisque, elevating the dish to another level. Complimentary grated truffle was also provided. 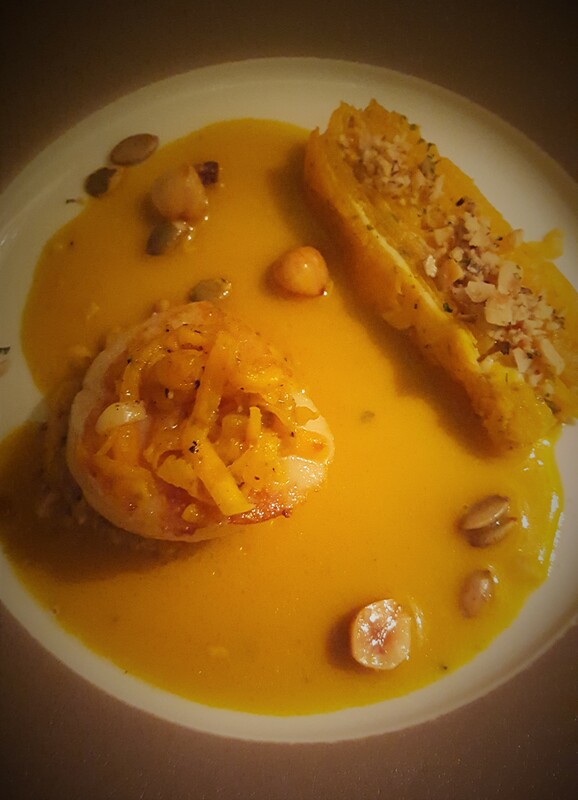 I’m very partial to scallops and wasn’t disappointed by this dish, which was accompanied by a hazelnut and pumpkin millefeuille; unusual and delicious. We were getting full, but when we smelt the chocolate and red wine jus as it was being poured over the saddle of venison with celeriac puree, there was no stopping us! 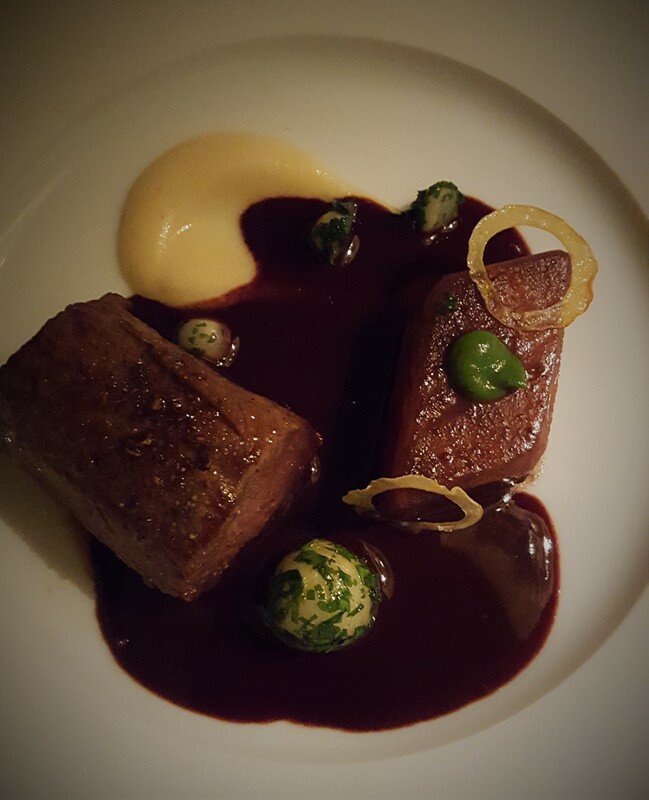 The meat was rare, the celeriac puree was smooth and the potato had a lovely pea puree running through the middle. 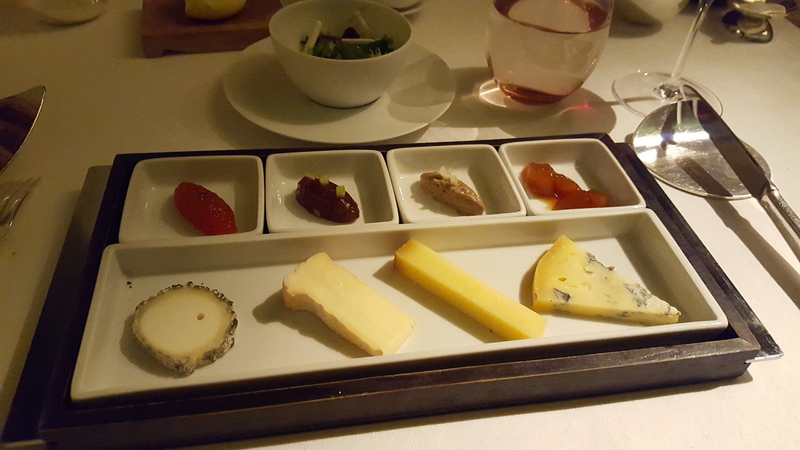 The penultimate course was the cheeseboard: 4 pieces matched with 4 chutneys. My favourite was the Reblochon in all its pungent and unapologetic glory. To prepare us for the transition to sweet, we were given a selection of petits-fours: macaroons (chocolate, coffee and coconut and lime) and two types of dark chocolate. The dessert, vacherin with exotic fruit, was refreshing after the richness of each course. However, the birthday version was initially given to me despite having specified that we were celebrating Chef Savla’s birthday; another unexpected oversight. Dining at Alain Ducasse was a wonderful experience thanks to the warm welcome, knowledgeable staff and the sheer quality of the food. We were very surprised to have found some shell and that they had mixed up the dessert, but these issues were swiftly and professionally resolved, with a serving of baba au rhum to boot (sadly my second stomach had reached maximum capacity so I couldn’t even try a mouthful). Budget: £185 pp (2 tasting menus, 1 bottle of wine plus 12.% service).